Sentinel for dogs is an oral tablet for the prevention and control of flea populations, the prevention of heartworm disease and the treatment and control of roundworms, hookworms, and whipworms in dogs. The active ingredients in Sentinel for dogs are Milbemycin oxime, a heartworm and parasite preventative, and Lufenuron, an insect growth regulator. Female fleas feeding on treated animals will produce eggs that cannot hatch. The interruption of the flea life cycle results in effective long term flea control on the pet as well as in the environment. Generally, Sentinel is well tolerated by dogs of all ages and breeds, including Collie breeds and other herding animals. Sentinel for dogs should be given with a meal. Consult your veterinarian for a recommendation on heartworm and flea prevention for your pet. Side effects of Sentinel for dogs include depression, drowsiness, vomiting, itching, hives, loss of appetite, diarrhea, or seizures. Contact your veterinarian if any effects occur. 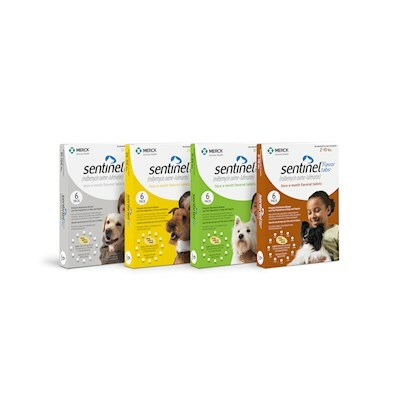 Sentinel for dogs contains Milbemycin oxime and Lufenuron. Administer Sentinel for dogs orally or crumble into food. A second treatment may be necessary.